The Robolight™ "ULTIMATE™ ". 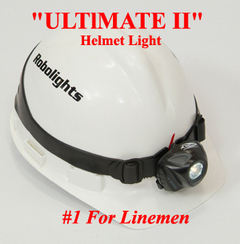 The #1 helmet light for Industrial Workers & Utility Linemen is now even better! 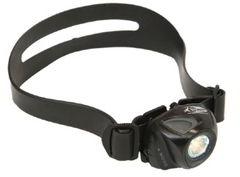 The Ultimate has 2xs the lumens and longer burn times!!! Utilizing a unique “Superbrite LED” and proprietary optics, the ULTIMATE™ is optimal for both localized needs and long distant spotting requirements (in fact, it is so powerful on the high setting that it can be used as a flashlight). Realizing that workers need different amounts of light for different conditions and situations – #7625 ULTIMATE™ Helmet Light is equipped with three brightness levels and a blinking emergency/signaling mode. 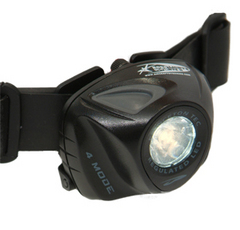 We guarantee that you will find this to be the best helmet light or we will refund your money! We also provide an unmatched 5 - Year Full Warranty (excluding batteries).